I used a photo etched mesh for the breathers. 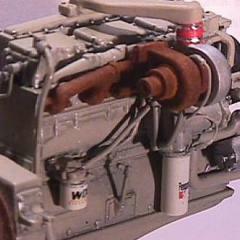 But the one I used was too short for the Revell part. I had to extend it with another piece of mesh. This is how I´ve done it. More pictures the next time. I ran out of batteries. Really looking good! Can't wait to see more! Here´s more. I continued on the open centre of the front wheel - passenger side. The tips of the Evergreen tube and rod is what I used. I also assembled this module. The silver lines are of two different thicknesses. The thin ones are elastic threads taken out of some clothing. The thick ones are cut off a bijoux bought in a toy shop. The rest of the cables are the standard electric wires. Man that is awesome. 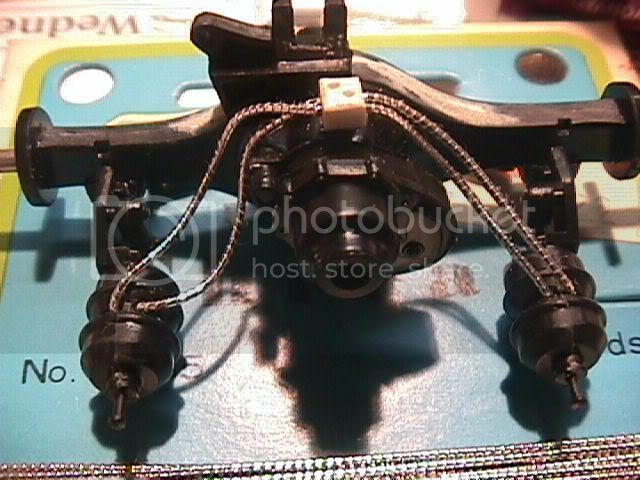 I will try to do a detailed model like this after I am done with my B87 Mack Gun Truck up in theAppocolypse 2012 Thread. Plan to do some detailing but not sure how far yet? I have taken a few close ups of the christmas candies string that used for plumbing the frame. The unpainted ends show the original color. The structure of the thread is well visible. I am just wondering if I can get something like this when Christmas is over. The idea came too late, the sweets were already eaten by my kids and papers with strings thrown away. I saved just a few pieces. Hey Jaroslay I bought this elastic thread years ago from a craft store here in the US. Do you have any craft stores over there that have sewing materials? They may have this. I am currently using it to replicate textured brake hoses. That is some great detail work and Ben thank's for the tip on the wire. Hi Jaroslav, great details! About the tires, I also think the original kit tires look a little strange. The fact that one of Klaus Lassen´s picture shows the wheel with no cap on it, is just welcome feature. Full Name:Model Car Builders Association...The Illuminati of the model world. Thanks for the great tips too. A little progress on Clydes II. The panel closing the opening on the back wall of the cab is bare on the inside while the real deal is upholstered. In the model, it is not much visible over the seats but I did not want to have a barewall in the back. I used a "poor man´s resin" again, the white paper glue. I poured a thick layer on the sleeper wall and let it dry for a few days. Then I peeled it off and cut to shape. I superglued this dry glue-piece to the panel and painted it light grey. Then I washed the surface with an oil color. These two pictures show the part before it was painted and after the paint and wash. The door of my cab will be open. So, it needs a fire extinguisher. I made it out of 5mm plastic rod. The valve is a 1.6mm (1/16") rod, the "jaws" on the upper end are made out of a soft tin and the hose is an electric wire. The extinguisher is strapped to a hanger made out of square plastic rod combined with the soft tin stripes. The decal is not authentic, no instructions on it. The roof clearance lights are too spiky in the kit. I made a little change in the shape. This is where I ended so far. I added a few wires to the firewall so it would not be bare. The wire is an ordinary steel string painted flat black. The fittings are from a set made by local guys for 1/24 scale cars. I am sorry for the finger print on the sun visor. Will do something with it. It happens to me now and then no matter how carefull I try to be. I added the boxes to the rear part of the chassis. this is amazing work! where did you get the front tires and wheels? I have an awesome idea for a set of these, they look great. Thanks for the comments. Chad, you find the front wheels in the Bill Signs kit. The tires are Italeri 10 pcs. set of tires for trailers. The inside diameter of the tires matches perfectly to the Revell super single wheels (Bill Signs and Can Do Wrecker kits). The only modification I had to do was to create inner rims for each side of the wheel. The inner rims hold the tires in place. These pics show the rims I added. Okay, time to show some progress here. Well, it´s more struggle than progress. I tested the cab and hood alignment and guess what! The hood didn´t shut tight! With the hood inside details added and the radiator raised (to fit the fan wheel axis) and AC condenser added (to imitate the real deal) it just didn´t work. Sometimes I make modifications without thinking too much ahead. So, part of the inside hood details had to go and some changes to radiator had to be done. The radiator looks almost the same. Only the AC condenser is a bit thinner and the radiator sits a bit lower. The typical back alignment of the engine is gone. What a shame! But the hood closes okay now and the cab can be mounted onto the frame for good. Here it is with the tubing in the engine bay. I knew that the under frame part of the exhaust piping had to be shortened. But how much? Instead of taking the measure I cut the part in two and inserted the tube in the muffler in a telescopic way. This will fit to any gap. Here is a test. By this time I realised that something was wrong. The frame rails had a pair of extra holes each. I thought something must be attached here. But I was wrong. The holes should have been filled in earlier. So, I had to do it now. To repair the holes in the rails wasn´t that difficult. But I found another holes that I forgot to fill in. These were in the cab just behind the door. Again, I thought that grab handles should go in. And they do. But not in the holes. Now it was much more difficult as the cab was A) painted, decaled, C) mounted on the chassis. But I couldn´t just leave them where they were. Here is what I´ve done. I have to repair the damaged decals some way. Sharpie markers would be convenient but they are not available over here as far as I am aware. Gotta find something simillar. Jarda that is a really great job on the detail, you have a really nice attention to the detail, did you use a air brush for the weather look? and can you give me a list were you used for the details like the electricle? no hurry.I also caught you used christmas candel wicks for the brake lines? MY EXTREME COMPLIMENTS TO MAN!!!!!! WOW ! Some of the finest modeling ever. Great job! Builds like this make me want to throw my stuff back in the closet, padlock the door and swallow the key!